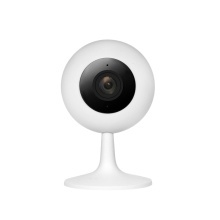 With the WiFi IP camera,you can sleep soundly and won&apos;t worry about your home when you are out! It can be a safe guard for your home.The built-in 6pcs 850nm IR-cut LEDs enable this surveillance camera to capture clear night vision images up to 8 meters distance. What is more, the external TF card slot provides not only a beautiful and integrated appearance but also a convenient storage method for you!It supports two-way audio,motion detection,real-time monitor and so on. *This is IMI LAB IP camera,believing you will be attracted by the mini shape and super-light design,Yes,that is,however,it is equipped with a large of strong functions behind the smart elegant design,a good choice for you. *720P HD quality vivid images for you,showing you what you care in your home,6pcs IR lights for night vision,IR distance is up to 8m(depending on the actual environment). *In addition to real-time viewing,it can insert a TF memory card(up to 64G,not included) to store video for look at any time,with external TF card slot,you can save lots of time for inserting the card,very convenient and practical. *When you are away home,you must be worried about the situations of your home or family or your love baby,so in this case,you can get to know the situation what you want to know by phone at anytime or anywhere. *Built-in microphone and speaker,support two-way remote dialogue,you can talk with your baby or lover freely without obstacle. *Support motion detection for more security protection,wide lens viewing angles to detect wide area,a real home guard to keep your home safe. *Device sharing:Support video sharing with family via mobile app features.To view the shared video,you need to download Mi Home App and use a Xiaomi account for login. *Believing you may be attracted by it&apos;s elegant and small design,it is a smart device with small size/light weight and strong functions for you and your family,come and to buy it! !